Walton's traditional Irish bodhráns are made from genuine goatskin. As goatskin is a natural material it can vary in color and texture. Over time, and with use, the design applique on the face of your bodhrán can begin to separate from the fibres of the goatskin and may flake off. The design on the bodhrán head can be preserved for an extended period of time with the use of the 'Walton's Bodhrán Care Cream'. 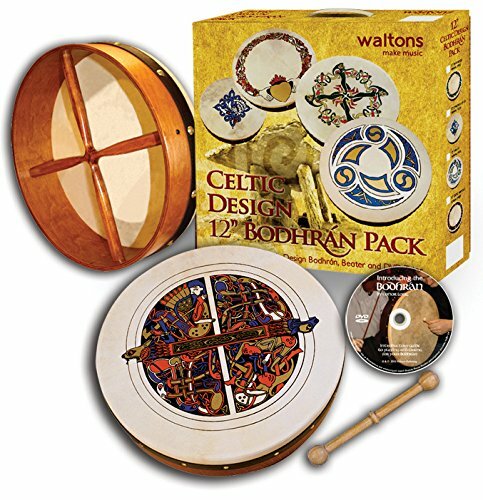 Walton's range of decorated bodhráns offers customers a chance to become familiar with the ancient drum for a fraction of the usual cost. Our bodhráns are intended for use by beginner players, or as a beautiful decorative piece for your home. PERFECT FOR BEGINNERS | Bodhrán face 12" in diameter. Intended for beginner players. If you are going for a very traditional straight forward but tonal sound, then the Walton Bodhrán drum is just the right one for you! INCLUDES A HARDWOOD BEATER | We provide you with a quality hardwood beater with every Bodhrán you buy. authentic traditional Irish instrument. GOAT SKIN HEAD | Bodhrán head is made from real goatskin. The Walton Bodhrán head has been much improved over the years. With many different varieties and ply's to the different sizes, the skin head of the Walton Bodhrán is a 2 ply goat skin with choice selected goatskin. QUALITY YOU CAN TRUST | The Bodhrán is an authentic traditional Irish instrument. We use higher quality wood which creates a much deeper and robust sounding Bodhrán gives you even more tone possibilities. Walton's Bodhrán are incredibly fun to play and provide many tonal qualities that you just cannot get from any other drum! If you have any questions about this product by Waltons, contact us by completing and submitting the form below. If you are looking for a specif part number, please include it with your message.